The North Carolina Healthy Start Foundation was established in 1990 with a five year, $5 million pledge from Glaxo, Inc. for the purpose of providing leadership in the state's effort to reduce North Carolina's unacceptably high infant mortality rate. The Foundation coordinated the Governor's Commission on Reduction of Infant Mortality, created by Executive Order #99 that same year, in response to North Carolina's designation as the state with the highest infant mortality rate in the country. Since its inception, the Foundation has grown into a nationally recognized, private nonprofit organization dedicated to reducing infant death and illness and to improving the health of women and young children in North Carolina. Since our beginning, the Foundation has been instrumental in the state's 34% reduction in infant mortality rates, now the lowest in the state's history. Through widespread outreach and public education strategies and policy initiatives, the Foundation has brought about fundamental change in policies and practices that are known to reduce infant death and improve the health of women of childbearing age. Over the last decade, the Foundation has been recognized three times by the National Healthy Mothers Healthy Babies Coalition for coordinating the best sustained public education campaigns in the country. All of the Foundation's highly visible and successful public education campaigns focus on improving the health of women, babies and children. Topics range from the health of women of childbearing age, pregnancy, reduction of the risk of Sudden Infant Death Syndrome (SIDS), children's health insurance and creating a "medical home" for children. 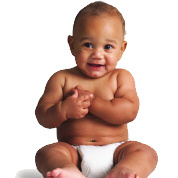 Efforts are also focused to reach African American and American Indian populations, groups at high risk for low birthweight and premature babies the single greatest cause of infant death in the state. The Foundation has a 16 year history of providing culturally and linguistically appropriate messages and materials for Latinos in North Carolina and has been recognized statewide. Through the Foundation's Community Grants Program (1990-95 and 1997-02), $4 million of much needed funding was awarded to 269 public and private agencies serving nearly all of the state's 100 counties. Preference for the funding was given to geographic areas with high infant death rates or high numbers, model infant mortality reduction programs and programs that focused on strategies known to reduce infant death and illness, such as smoking cessation, improving access to prenatal care and reduction of infections. From the outset, the Foundation has maintained unique public/private partnerships, developing strong relationships with state government agencies, coordinated its work with existing statewide organizations, and solicited input from local and statewide coalitions. This combination of collaborative public partnerships, award-winning public education campaigns, a successful grant program and role as advisor to government agencies and other nonprofit organizations has been a model for designing solutions that met the needs of agencies, communities and families. Today, the Foundation continues its work to significantly reduce infant death and illness in North Carolina. This includes expanding and solidifying new partnerships, enhancing media involvement and the use of social media, increasing public awareness of health-promoting behaviors and reaching out to the state's increasing Latino population. All these activities, taken together, will further the Foundation's efforts to improve the health of mothers and save the lives of babies across the state.